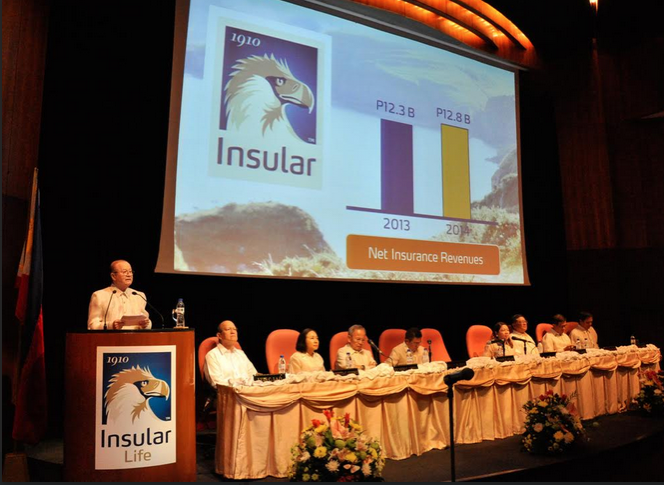 The country’s largest Filipino life insurer, The Insular Life Assurance Company, Ltd., reported a consolidated net income of P2.9 billion in 2014, up by 21 percent from the previous year. At the Annual Members’ Meeting of the only mutual life insurance company in the country, held recently at the corporate headquarters in Alabang Muntinlupa, Insular Life Chairman of the Board and Chief Executive Officer, Vicente R. Ayllon, reported on the gains of the Insular Group, led by Insular Life, which posted P11.9 billion in total premiums, up by six percent. New business premiums also increased by seven percent to reach P7.9 billion. Insular Life was one of only four top life insurers that posted growth in 2014, despite the negative growth of the life insurance industry as a whole in 2014. “We had a slow start in 2014, but we had a tremendous rebound beginning middle of the year, that enabled us to surpass our previous year’s premium income. In fact, the momentum has continued even during the first quarter of this year. We attribute this growth to the much improved productivity of our sales force, new product investment linked products and our continued effort to educate the public on the value of financial management,” says Ayllon. The company launched five new products in 2014 three of which were single pay investment-linked insurance products. These were the I-Peso Enrich, a peso-denominated, single-pay product that provides annual returns ranging from 4.25 percent to 5.25 percent; I-Peso ProEarn, a single-pay product that guarantees returns every year for seven years; and I-Peso Preferred Plus, a single-pay product that provides fixed annual returns of as much as 3.75 percent. It also offered I-Dollar Earnings Advantage (I-DEA), a structured investment-linked insurance product that allows investors to earn potential yields from equities while preserving their principal; and a 10-pay savings and retirement savings plan called I-Fulfill. Funds, the Growth Fund delivered the best performance as end of 2014, posting gains of 25.4 percent. “We utilized various media especially social media and the internet to spread awareness of the importance of financial planning even for the younger members of the working population. Financial education is an advocacy that we have been espousing for many years now. And I believe this initiative has also helped in penetrating sectors that were not previously well informed about life insurance and financial planning,” Ayllon said. The company also reported consolidated revenues of P19.6 billion from P19.3 billion a year ago. Consolidated assets grew to P101.3 billion, up by eight percent from P94.2 billion. Total insurance benefits and operating expenses reached P16.4 billion. Insular Life is the parent company of the Insular Group which is composed of three wholly owned subsidiaries - Insular Health Care, Inc., Insular Investment Corporation, Home Credit Mutual Loan & Building Association – and affiliate Mapfre Insular Insurance Corporation.